Two Incredible Experiences, Back to Back: I Danced with Debbie Allen… and Spoke at the Getty Center! What a fun couple days! 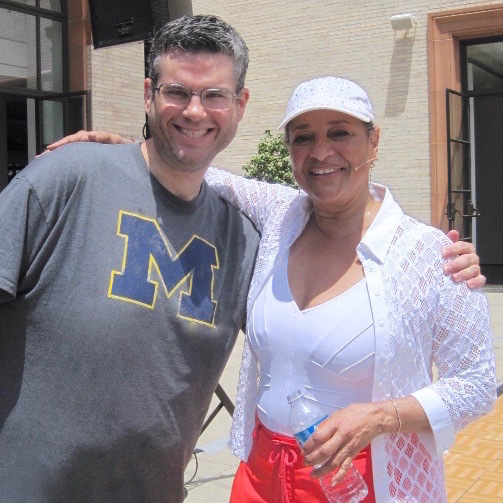 On Sunday, I took a salsa dancing class from the legendary Debbie Allen. It was a blast! My First Visit to Minnesota… and It Only Lasted 22 Hours! A few weeks ago, my friend Margo (who is a blogger and YouTuber) invited me to participate in a charity project, and I jumped at the chance. I got the final product the other day, and it’s super cool. 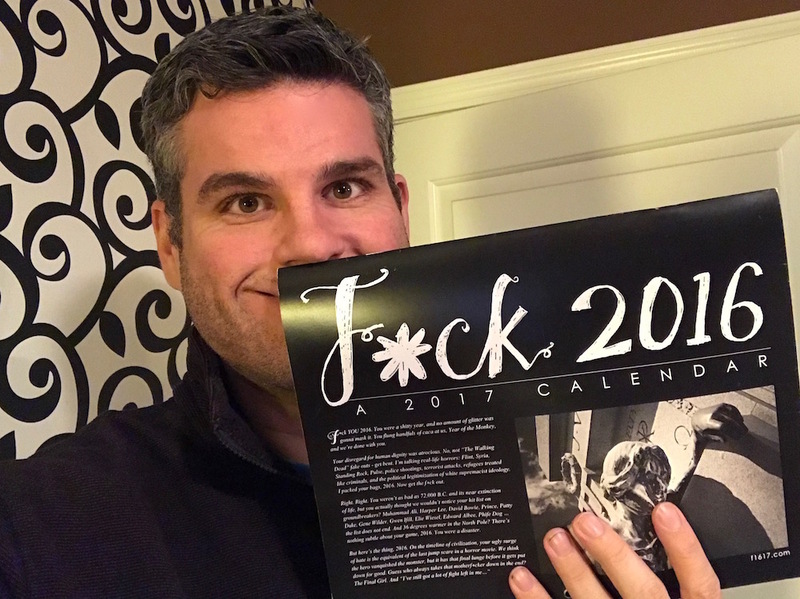 Introducing… F*CK 2016 – A 2017 CALENDAR! GET LOST… In a Maze! This is an exciting post for me to write, because I get to share something that I’ve devoted a lot of effort to in recent months: I’ve started a business! Happy Monday! I hope you had a good weekend, because I did. I hit two big milestones at the gym, and kept busy otherwise… but I’m going to get into all that tomorrow. Today, I’m introducing a new feature to Keep It Up, David! This is kinda sorta completely random, but I have a strange little talent that’s has nothing to do with anything else that I blog about. Lately, though, this talent has really come in handy. About a week ago, I mentioned in a post that I sometimes draw as a mental distraction. There are times when I’m relaxing or watching TV, and all I seem to think about is snacking. It happens most frequently at night – I’ve had a good dinner, and I’m not actually hungry, but I get an overwhelming desire to keep eating, and I start fixating on the food I have in the house. Sometimes I’ll give in, and rustle up some fruit or carrot sticks, but sometimes I try to fight it. And one of the best tools I have in my arsenal is a pencil. My parents will vouch that once I learned how to use a pencil, I was hooked. A lot of my doodling, even at a young age, was design-based: creating floor plans for houses, designing golf courses and shopping malls, things like that. But I also developed a keen ability to create puzzles. My grandfather taught me how to create word searches when I was about 6 years old, and I can still make a mean word search to this day, ones on par with Wonderword, my favorite word search puzzle out there. I’m don’t remember when my fascination with mazes began, but it was also early on, and I became quite good at solving them, and then drawing them. I’ve been able to draw them for as long as I can remember (I used to submit them to be included in my elementary school newsletter), and lately I’ve been drawing them a lot. My nephews are now old enough to solve mazes (they’re 5, 6, and 7), so for the past two Christmases, I’ve made maze books for them – a collection of mazes that I bind together at an office supply store. Mazes are fun for me to draw. I like brainstorming and creating the theme or look of the maze, and keeping track of the dead ends and correct path is a nifty little challenge. 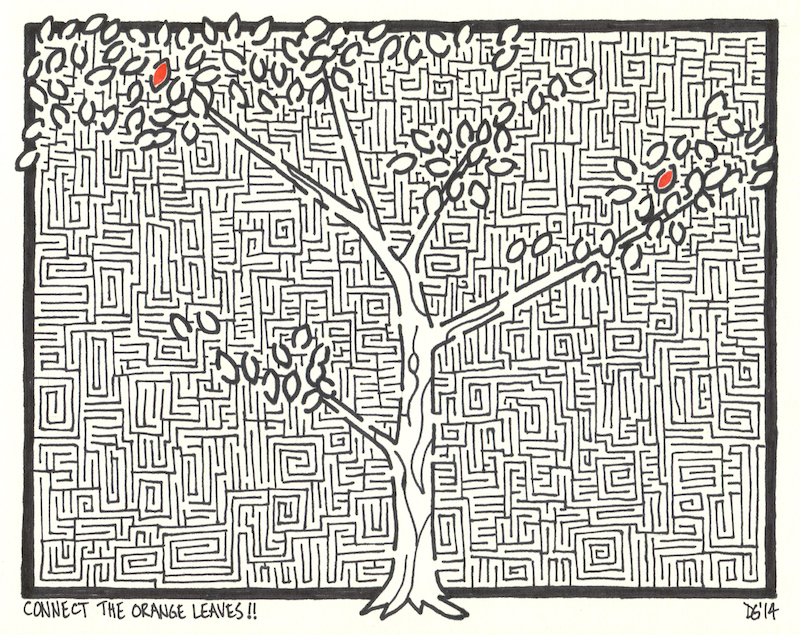 The ability to solve a maze is important – all of my mazes have exactly one path from start to finish. Lately, whenever I’ve needed to distract my own brain from a food fixation, I’ve drawn a maze. And since they’re no fun for me to solve, I’m gonna turn my own little form of therapy into a blog feature, and give YOU the opportunity to solve them! Are you ready? This maze is the result of my playing around with concentric circles. The directions are simple: CONNECT THE TWO STARS. There is only one path between them. The maze is hand-drawn, by me, using a black pen and a Sharpie, and the original is on a piece of 8.5″ x 11″ paper. This is the first PDF I’ve posted on this blog, so please let me know if there are issues. I chose the PDF format so you could easily download and print it. I did a trial run, and I was able to print it without a problem, so hopefully you’ll be able to as well.